The opening scene of Greta Gerwig’s “Lady Bird” begins with a top shot of the titular character and her mother facing each other as they sleep on a bed while on a college tour. Throughout the movie, we see both women traverse the same routes of the city they will continue to share for only a few more months, as their bonds stretch and fray, mend, change, and stretch again. As their separation looms, so their relationship grows deeper to the point where the slightest nonverbal gesture says more than an entire lecture, while a simple written letter is harder than a thousand spoken words. She longs for the “culture” of the East Coast schools, but her mom, Marion (Laurie Metcalf) has neither the desire nor the money to send her across the country. The McPhersons live in the more working-class side of town in a modest home with one bathroom for five people, where a trip to the grocery store is met with anxiety at the register, and any blip on a high school transcript could affect financial aid or admission into college. Marion and Lady Bird’s father, Larry (Tracy Letts), scraped tuition together so their daughter could go to a private high school, so the looming spectre of college fees are a daily source of tension and stress. The trouble with Lady Bird and Marion is that they are so much alike and so dependent on each other for emotional sustenance, even if it drives the other crazy. As they scour the racks at the local thrift shop, it is like watching two halves of a whole fighting to speak over the other as they scrutinize each other’s walk, comments, attitude, and influence. Marion worries that Lady Bird may be too influenced by her wealthier friends. Lady Bird wants Marion to stop noticing every detail of her life. They pause briefly to agree on a dress and reach a temporary detente until the next battle looms. Writer-director Gerwig, who was born in Sacramento and went to college on the east coast, treats the city with a fond poignancy of someone who remembers every route to treasured places, the nicer neighborhoods with the pretty houses, the clubs where the cute boys hung out or played in their bands. Lady Bird and her best friend, Julie (Beanie Feldstein) lean on each other as only childhood friends can, with that stifled, unsettling feeling that their good times together are numbered. Oftentimes, separation comes as a defense mechanism as a delay against the inevitable. Lady Bird fights against so much inevitable, from her father losing his job and taking pills for depression to her mom making too much sense during her lectures. She longs to breathe and stretch and stumble around, free from the ordinary comforts and conventions of the hometown she’s known her entire life. Gerwig doesn’t let her off easy either, as she makes Marion and Larry have soul and heart and tenacity and perseverance — all of which their daughter observes even when she refuses to see. Larry stoops to apply for a job he is overqualified and too old for (and for which his stepson applies, too). Marion complains about being the “bad cop” when disciplining her daughter but refuses to relent on her work ethic to raise a daughter who realizes that she is connected to people who have sacrificed to give her choice and opportunity. All the merits of Gerwig’s sharp, funny, and bittersweet script would not have the urgency and intensity without the tremendous cast who embody their characters with eloquence and depth. Aside from the excellent Metcalf and Letts, the other mature actors who play the teaching priests and nuns at the high school are wonderful as well, especially Lois Smith as a guidance counselor and Stephen Henderson in a heartbreaking turn as an emotionally fragile drama coach. Saoirse Ronan is one of the brightest stars of her generation, able to switch from ebullient to tormented, confident to awkward in an instant and never uttering a false note. She is magic to watch and has that oldsoul gravitas, like a young Jodie Foster or Natalie Wood. Her fellow costars are to be commended as well, especially Feldstein as the effervescent Julie, as secure in her future as Lady Bird is anxious. Together, the two investigate the whispered intricacies of teenage femininity, from sexuality and self-pleasure to prom fashions. Lucas Hedges and Timothée Chalamet play two suitors vying for her affections but with different dramas behind the charming personas of high-school crushes. 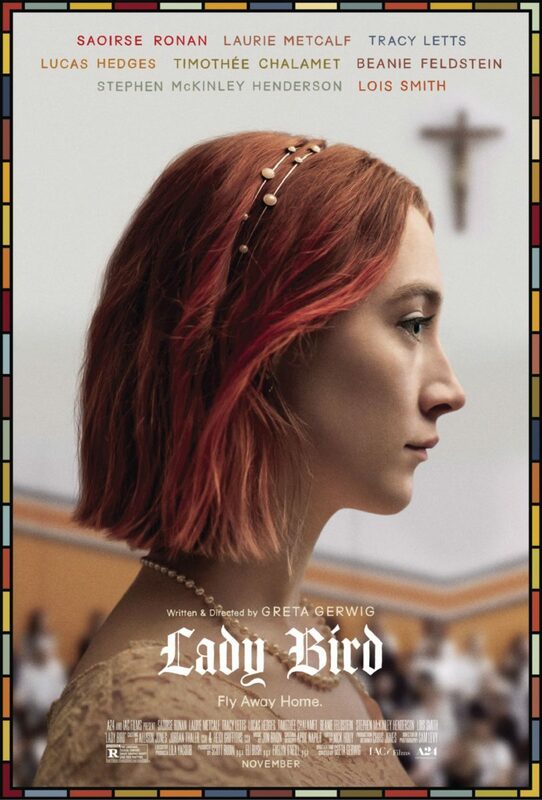 Through it all, Lady Bird is so sure she is done with Sacramento simply because she has memorized every inch of it, while really it, and its people, has formed how she will see the world from then on.